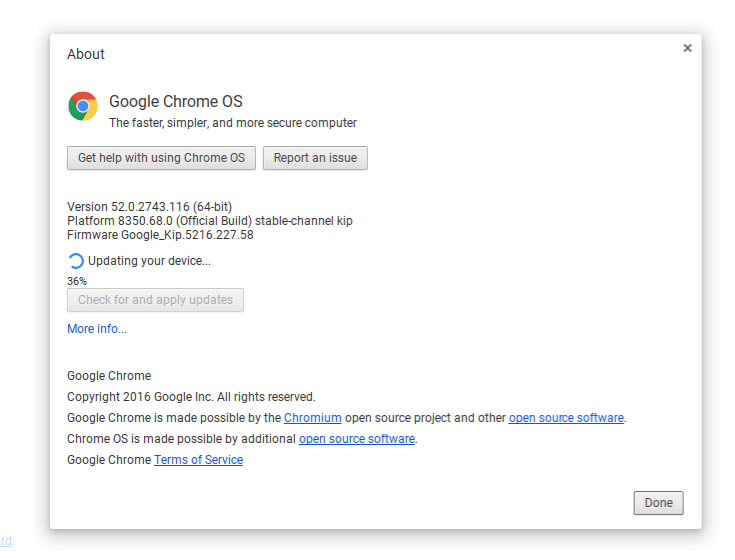 Chrome OS has been updated today to build level 53 for a wide range of devices. The new build is version 53.0.2785.103 (Platform version: 8530.81.0) for those keeping score at home and it is already available to download to your Chromebook or Chromebox. The update is for the vast majority of devices out there with the notable exception of the Google Chromebook Pixel (2015), Acer Chromebook R11, ASUS Chromebook Flip C100PA, HP Chromebox CB1, and Acer C7 Chromebook. Those devices, as you probably already know, are running a built that includes Android apps. This new build for the rest of the devices out there does not contain the ability to add Android apps to your Chrome device. There are of course other security enhancements and fixes in this update but the exact details are not listed out in the post. Given the update to the Chrome browser last week to build 53, chances are many of the security updates and improvements found there are also found in this release of the OS. Like all Chrome OS updates, it will be pushed to your device over the course of the next few days. If you are impatient (Clinton raises his hand) and want to get the update now, just type chrome://help in the browser on your Chrome device and click the “Check for Update” button. The new build will download for you automatically and after a reboot, you will be on the new build.